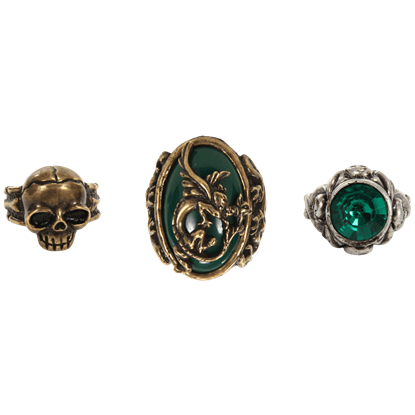 We are proud to present our selection of pirate and nautical rings. 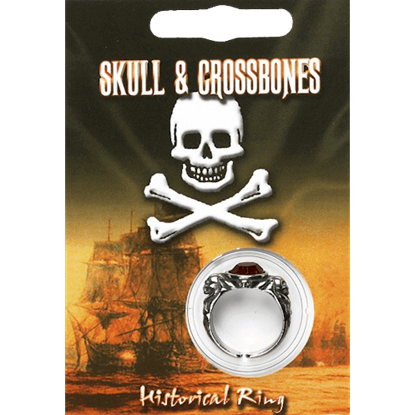 These rings feature designs like pirate captains, pirate swords, and skull and crossbones. 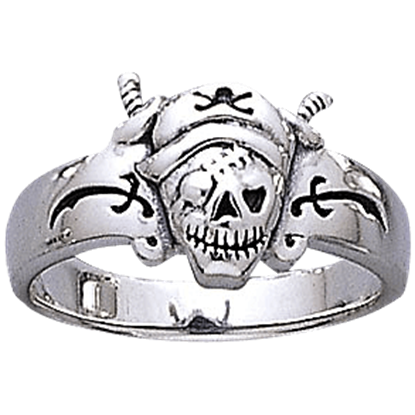 Many of our pirate rings are made of quality sterling silver. Pirate and nautical jewelry will add the perfect touch to your pirate garb. but are also great for everyday wear and the perfect gift for the pirate in your life. Pirates frequently find themselves in possession of beautiful pieces of jewelry, and that is truer for a female pirate than any other. 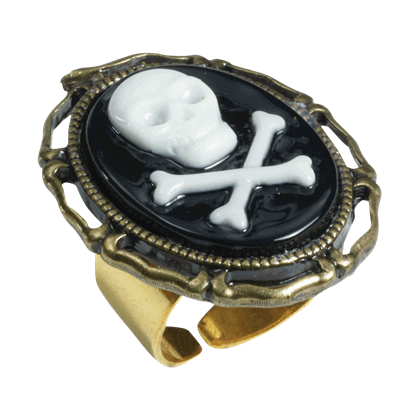 This Buccaneer Beauty Cameo Ring is definitely an accessory that a pirate lass would want to have. The Jolly Roger, with its skull and crossbones design, has long been a symbol of pirates. 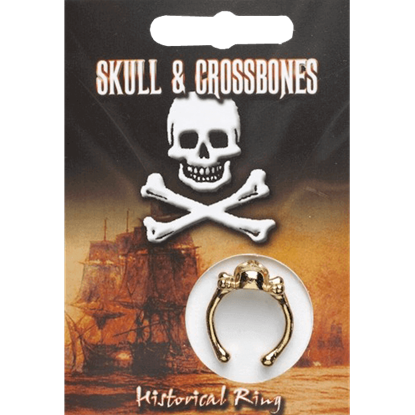 Now, you can wear that symbol on your finger and feel like an authentic pirate whenever you put on this Gold Plated Skull and Crossbones Ring. There is nothing worse for a merchant sailor than to see a ring like this Pewter Pirate Gem Ring up close, because that means that they have been boarded by pirates and are likely to soon lose their ship, their cargo, and much more. The Jolly Roger, with its skull and crossbones design, has long been a classic symbol of pirates. 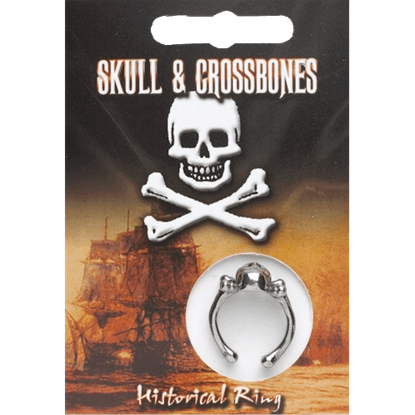 Now, you can wear that symbol on your finger and feel like an authentic pirate whenever you put on this Pewter Skull and Crossbones Ring. Pirates have an obvious love for skulls. It is readily apparent when you look at their flags. They also love treasure. Those loves combine in this Pirate Skull Ring, which features a fearsome looking skull and a shining silver glimmer. Any scallywag would be lucky to own a pirate ring this fine! 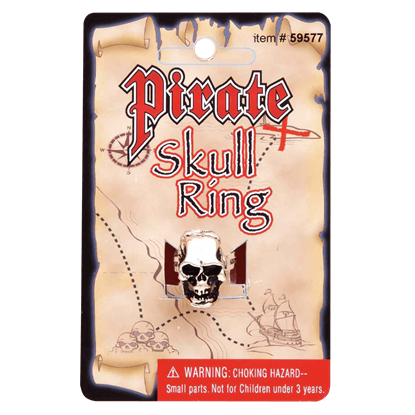 The Silver Pirate Skull Ring offers an eye-catching swashbuckler design that features a skeletal pirate wearing a patch and Jolly Roger hat at the top of the band. If you are looking for a pirate with style, look no further than Jack Sparrow. Get his look with the Jack Sparrow Ring Set, three rings based on the jewelry worn by Johnny Depp as Jack Sparrow in the Pirates of the Caribbean films.